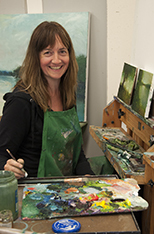 Professor Nichols-Pethick has been teaching painting and drawing courses at Indiana State University since 2003. Through large-scale figurative painting, landscape, portraiture, and collage, she examines the strange and often incongruous relationship between people and the natural world they inhabit. Her particular interests include 19th century American landscape painting, contemporary figuration, and poetry--these inform her studio work, which is fueled by coffee and music of all kinds.